Some people might not call Disneyland's Main Street vehicles "rides" - and they'd be right if they're talking about attractions. You may think you have to stand in line for "rides" and they will take you on dark and speedy — or slow and cheerful — adventure through Disney magic. Nevertheless, they are "rides" as defined by the Urban Dictionary: "A vehicle or mode of transportation. Usually belongs to someone else." Each of the vehicles run on a loop route between Town Square (near City Hall) and Central Plaza in front of Sleeping Beauty Castle. Technically your trip on any of them is one way, but you can get out and jump back on a different vehicle to go back to where you started. Your best chance of seeing and riding them is in the morning before crowds build up. They typically stop running for the day by mid-afternoon. The Main Street vehicles are a fun way to get from one end of Main Street to the other, and they're also simple: no Fastpasses, no single rider lines, no age or height requirements. They're also an excellent way to make the trip down Main Street while resting your tired feet. Chat up your driver along the way. Those friendly, knowledgeable Cast Members can tell you a lot of fascinating things about the park. Many parents report that their preschoolers love riding the Main Street vehicles so much that insist on taking every single one of them. Like any other attraction at Disneyland, the vehicles sometimes need maintenance, renovation, or upgrades. To find out their current status, check the Park Hours tab of the monthly calendar page to see what's being worked on. Most of these vintage-style vehicles require visitors to step up into them. If you're in a wheelchair or ECV, you will have to do that by yourself or with help from your companions. Wheelchairs may be folded and placed in the vehicle. ECVs will have to stay behind — which means you'll have to make a round trip to retrieve them. 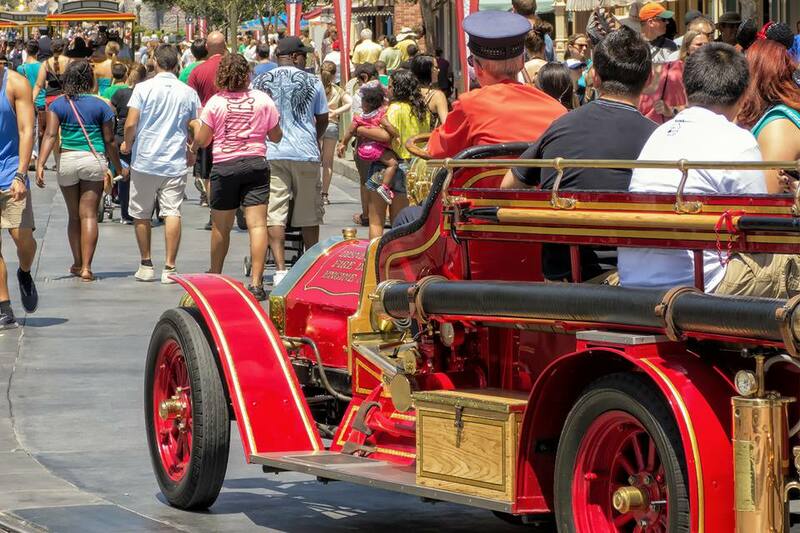 On opening day at Disneyland, a fire engine was one of the Main Street vehicles. In fact, people say Walt Disney enjoyed driving that fire engine himself, especially in the morning before the park opened. That original fire wagon is now permanently parked in the Main Street Fire Station. The Main Street fire engine that replaced it is pure Disney. It was designed by Disney legend Bob Gurr and assembled at the Disney Studios about 45 minutes' drive from Disneyland. So the story goes, Gurr didn’t have it delivered on the back of a flatbed truck. Instead, he drove it to Disneyland himself. The fire engine can accommodate about 8 to 10 people at a time. What exactly is an omnibus, you may be wondering? It's a "usually automotive public vehicle" designed to carry a large number of passengers according to the Merriam-Webster dictionary. Disneyland's Omnibus is a 45-passenger, double-decker bus similar to the ones that ran in New York City in the 1920s. The upper level of the Omnibus is a great place to get photographs, and if you take it from Town Square to Central Plaza, you'll get excellent views of the castle. The Main Street USA streetcar runs down the tracks you see in the middle of Main Street. It is drawn by a lovely draft horse, one of a stable of Disney horses. According to the Disneyland blog, the breeds used include Percheron, Clydesdale, Belgian and Shire horses. They also say: "No Disneyland horse works more than 4 hours a day, 3 days a week. And, like all cast members, the horses at Disneyland park always wear their name tags when they are working." The streetcar carries 30 passengers at a time, at a leisurely 4 mile per hour. You might also wonder what a jitney is - and by now you may be wondering why the main street vehicles have such funny names. That's a question that has no answer, but here's the origin of "jitney," summarized from the Merriam-Webster Dictionary: The word was slang for a nickel coin in the early 1900s. Over time, the word was applied to small buses that cost only a nickel to ride. At Disneyland, you can keep your nickels in your pocket and ride the jitney for free. Disneyland's jitney looks a little bit like a horse-drawn surrey with fringe on the top. It's modeled after the horseless carriages built in the early 1900s. The jitney has two-cylinder, four-horsepower engines with manual transmission and steering. The jitney carries about 8 to 10 people at a time.